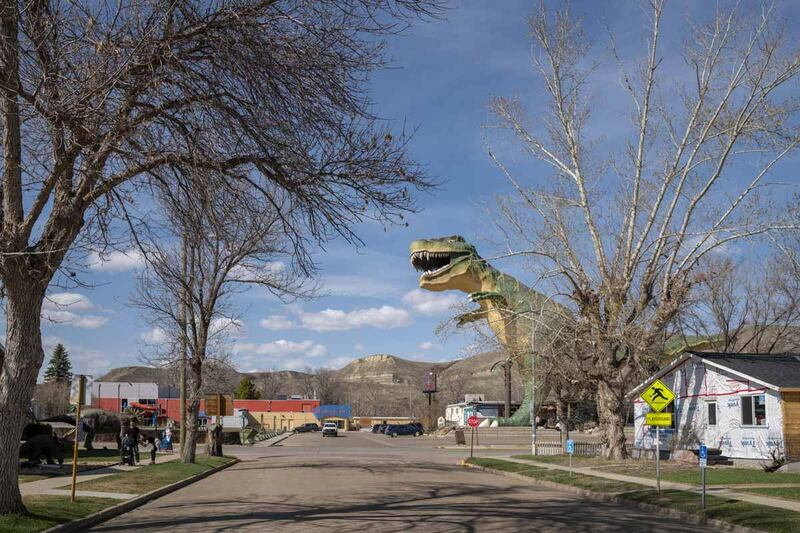 So, what’s the dinosaur capital of the world? Costa Rica? China? The Gobi Desert? Well… the title of world’s best dinosaur capital is held by the town of Drumheller, Alberta, a spectacular place lost in the Canada Badlands. 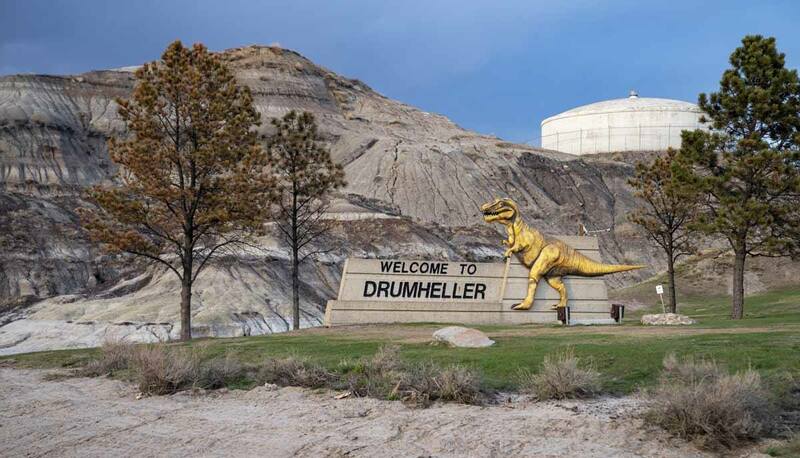 Come and discover the best things to do in Drumheller – with lots of dinosaur activities! Travelling between Edmonton and Drumheller, you’ll find it hard to believe that this part of Alberta was once covered by the sea, and then by a tropical rainforest. 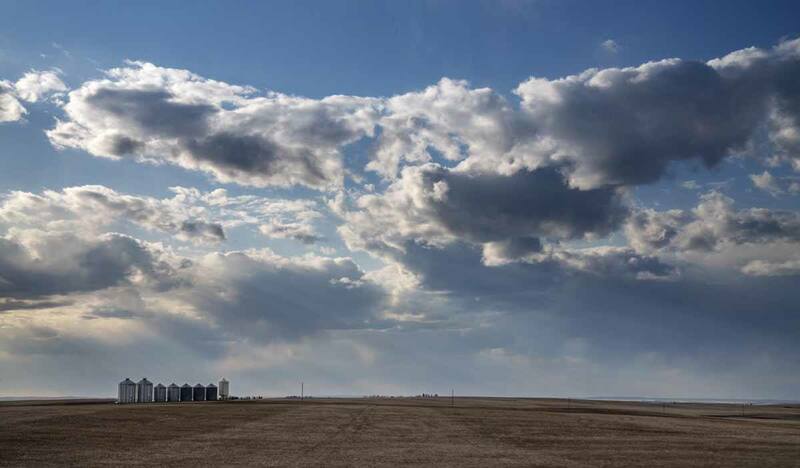 The prairie surrounds you as far as the eye can see – a landscape so flat and monotonous, with perfectly straight roads, that even the slightest bend feels like a welcome change. 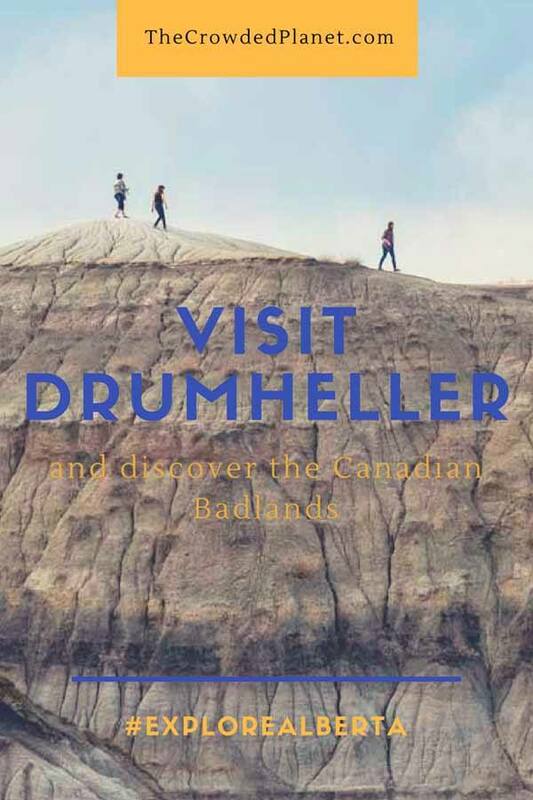 Then, just before you hit the town of Drumheller, everything changes – the road takes a sharp turn downhill, and you’ll find yourself surrounded by strange formations, hills and mesas made of multicoloured rock layers – part rusty brown, part beige, with purple and green lines throughout. This is the heart of the Alberta Badlands, a type of terrain characterised by sedimentary rock formations, eroded over time by wind and water. 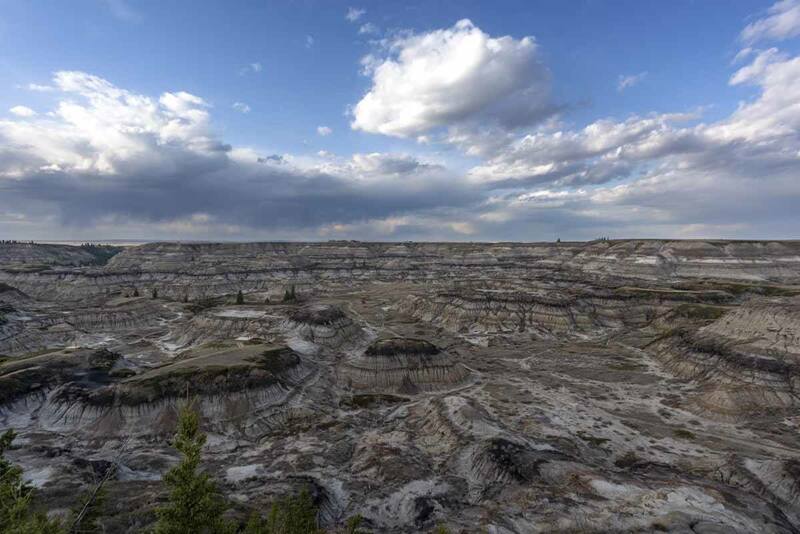 The Badlands are very hard to cross on foot, hard to navigate, and near impossible to cultivate – this earned them the moniker terres mauvaises, Badlands in English, given to them by the first fur trappers who ventured to this part of the Canadian West. The stunning Badlands scenery alone would be reason enough to travel to Drumheller, but there’s another even more amazing drawcard in town – dinosaurs. 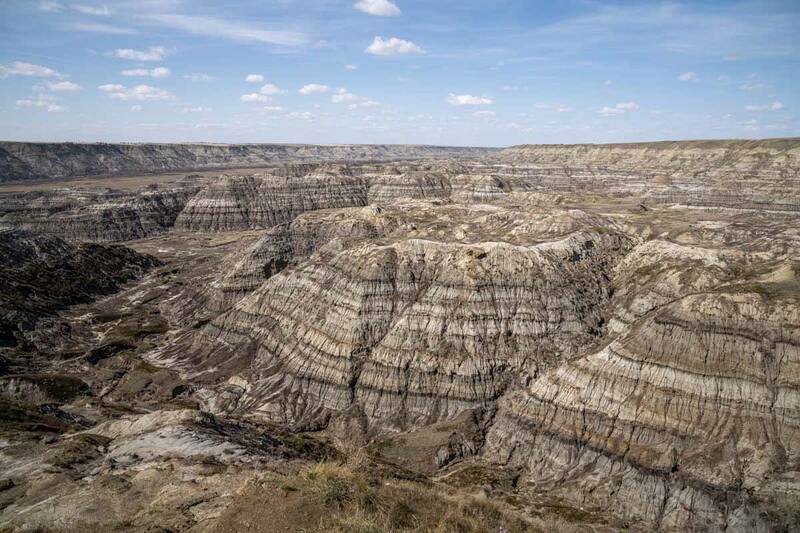 If there ever was a real life Jurassic Park location, this would be it – the area surrounding Drumheller was home to a staggering amount of dinosaur-related discoveries, including fossils, skeletons, dinosaur egg sites and track fields, and even a ‘mummified dinosaur’. As soon as you arrive in Drumheller, the ‘dinosaur connection’ is immediately apparent – the town entrance sign sports a giant golden Albertosaurus (a cousin to the T-Rex), every other business seems to have ‘dinosaur’, ‘fossil’ or ‘jurassic’-something in the name, and you can’t walk a single block without coming across a fiberglass dinosaur statue in someone’s back garden. 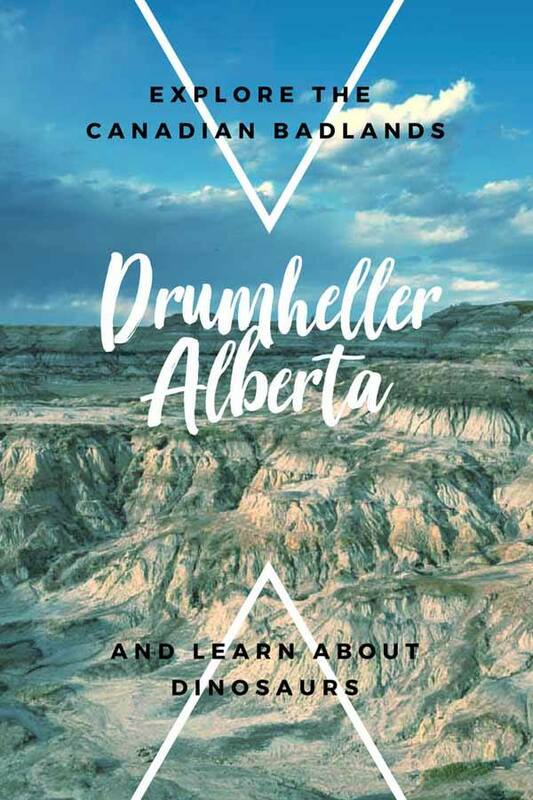 Yet, to understand Drumheller and Alberta’s connection with dinosaurs there’s only one place to start – the Royal Tyrrell Museum, a museum and paleontological centre dedicated to the discoveries that took place in Alberta from the late 19th century onwards. If you’re into dinosaurs, you’ll be in heaven at the Royal Tyrrell Museum. 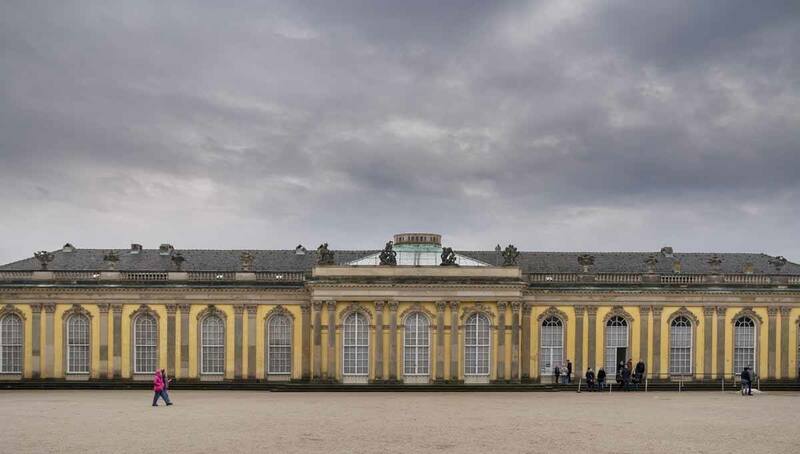 If you don’t know much about them, you’ll walk out wanting to become a palaeontologist – the museum is just outstanding, definitely in the top 5 museums we’ve ever been to, together with the Computerspielemuseum in Berlin. If you think you’ll be done visiting it in an hour or so, think again – we spent 5 hours in the museum, and could easily have stayed longer. 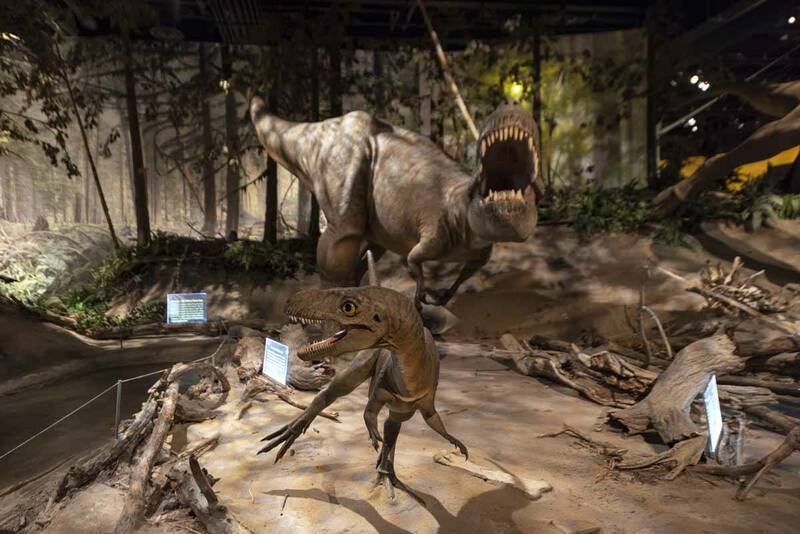 The museum starts with a section called Cretaceous Alberta, recreating life in the region 69 million years ago, when it was covered by a lush rainforest. An Albertosaurus, the apex predator of its time an a distant cousin to the T-Rex, who lived a few million years later, looms between the trees. 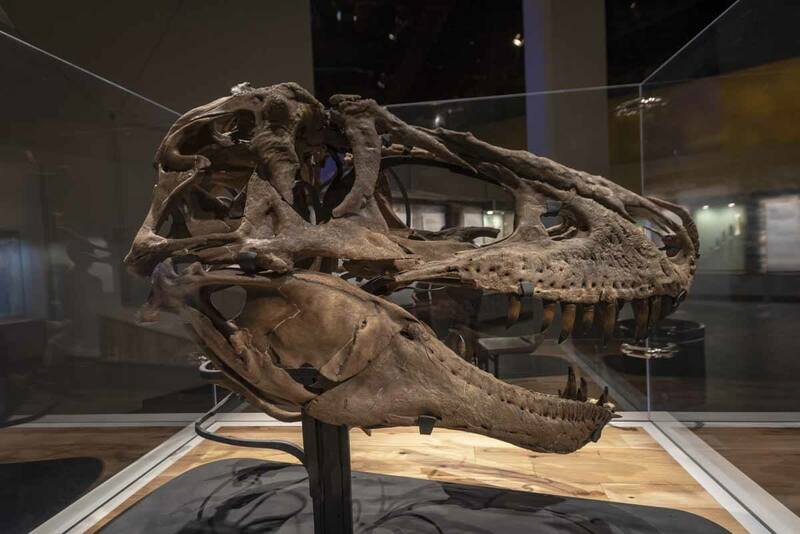 This is only a taste of what’s to come within the walls of the museum – as you move through the halls you’ll be surrounded by some of the most stunning fossils ever found, including the entire skeleton of a juvenile Gorgosaurus and a rare T-Rex skull, complete with razor-sharp teeth. There is also a section recreating the look of Alberta when it was covered by the sea, over 400 million years ago; a greenhouse with a ‘cretaceaous garden’ and naturally, the Dinosaur Hall, the star of the whole show, the largest collection of dinosaur skeletons on display. You won’t just find well known specimens like the Brontosaurus and Triceratops, but also dinosaurs you may not have heard of before like the Pachyrhinosaurus, with horns and bone buttresses over the skull. Other amazing exhibits on display at the Royal Tyrrell Museum include the mummified Nodosaurus, a 6-metre long, armoured-skin dinosaur, discovered recently by mine workers, and the staggering ichthyosaur, the largest marine reptile ever to have lived, 21 meters long. 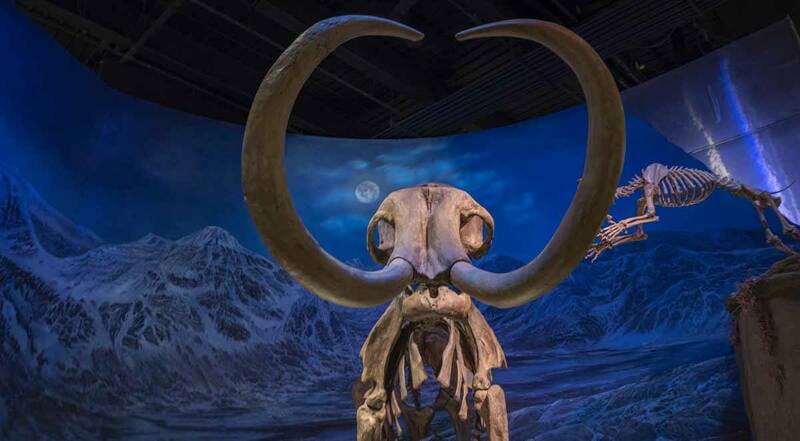 There are also skeletons of wooly mammoths, uintatheres and other extinct mammals, detailing the history of evolution all the way to the present day. After visiting the Royal Tyrrell Museum, you’ll realise why Drumheller and Alberta are considered the dinosaur capital of the world – these’s simply nowhere else that compares in terms of number and variety of dinosaur discoveries. To give you an idea, 5% of all dinosaur species that ever roamed the world were found in Alberta. 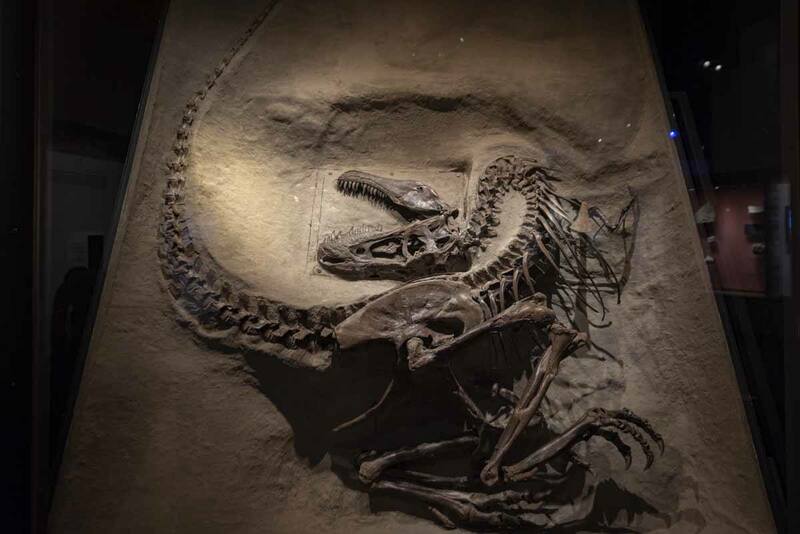 More than 400 dinosaur skeletons were discovered since the first discovery in 1889 of an Albertosaurus fossil. Why so many, you may ask. We certainly wondered that. 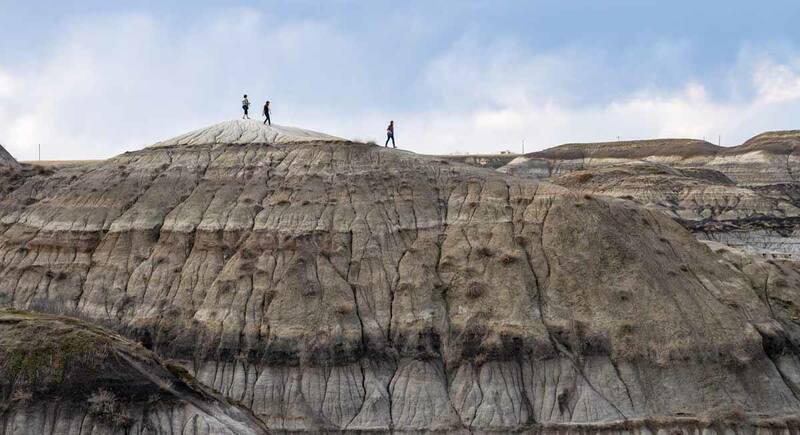 The Royal Tyrrell Museum does answer the question, but it is only by getting out and touring the Badlands that you’ll see why this area is unlike any other in terms of geology. 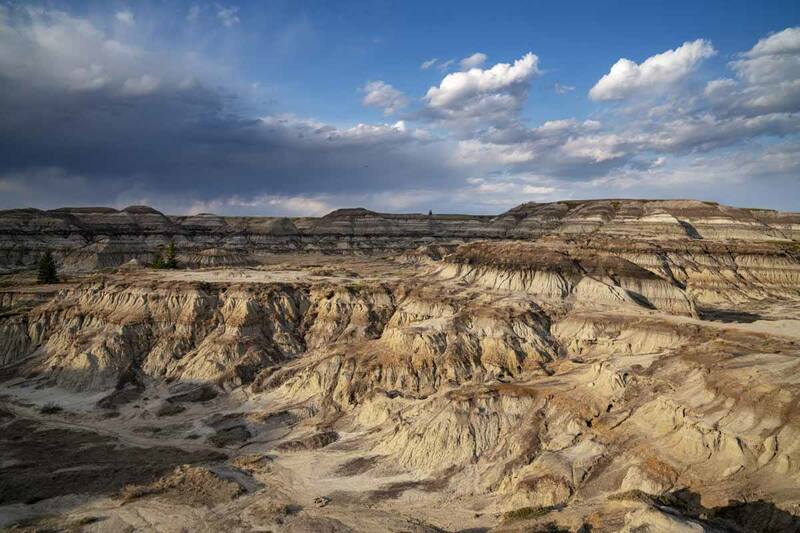 We recommend starting your ‘Badlands adventure’ with the 1 kilometre-long interpretive trail situated just outside the Royal Tyrrell Museum, fitted with 12 signboards highlighting info about the Badlands geology and ecosystem. We learned that the layer-like appearance of Badlands rocks is a summary of the geological history of the area throughout the millennia. The paler bands of rock are sandstone, originating from sand deposited by large rivers. The darker deposits come from floodwater, that brought mudstone and siltstone, while the darkest layers are actually coal, coming from compressed organic material that accumulated in swamps. Can you see all the layers? Basically, the Badlands are Alberta’s history book, revealing information about a time that is so far away, it seems unfathomable. Back then, the area was humid and criss-crossed by rivers, creating sand and mud deposits where several dinosaurs met their death – several mass graves were found, evidence of herding behaviour. 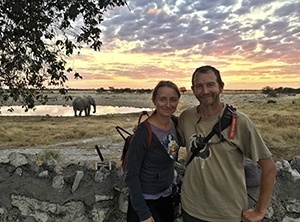 The sand and mud deposits provided the ideal conditions for fossilisation – every year more and more fossils come to light, as the rain washes off the outer layers of sediment. 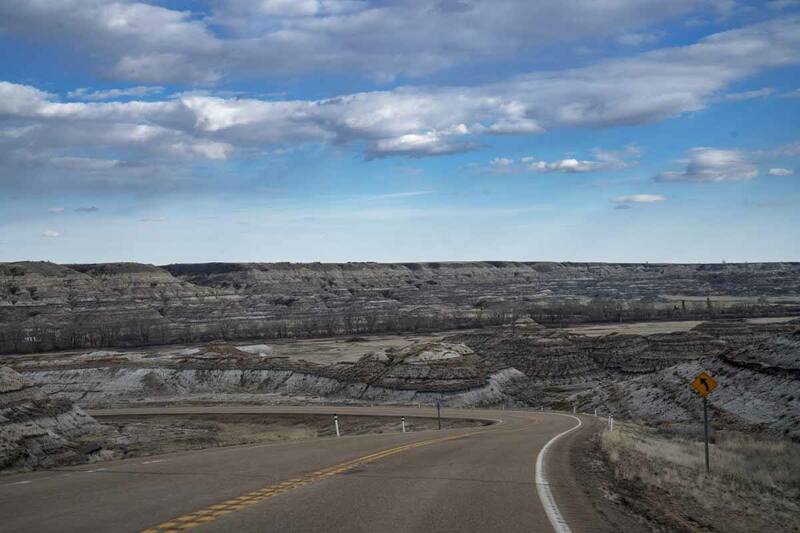 If you have your own vehicle, there are two wonderful routes to explore the Badlands – one is the Dinosaur Trail, a 48-km scenic drive looping around the Red Deer River, including a crossing by cable ferry (only available in summer). The Dinosaur Trail takes you to scenic viewpoints like Horsethief Canyon and Horseshoe Canyon – the latter just a short detour away from the main trail. Horsethief is only a viewpoint from where you can see the majesty of the canyon below, carved by a tributary of the Red Deer River, whereas you can hike to the bottom of Horseshoe Canyon to see the rocks up close, and to feel surrounded by the surreal moon-like landscape, especially spectacular at sunset. Another scenic drive is the Hoodoo Trail, about 20 km southwest from Drumheller. The Hoodoos are strange mushroom/chimney-like formation – in Cree lore, they’re believed to be petrified giants guarding the valley. 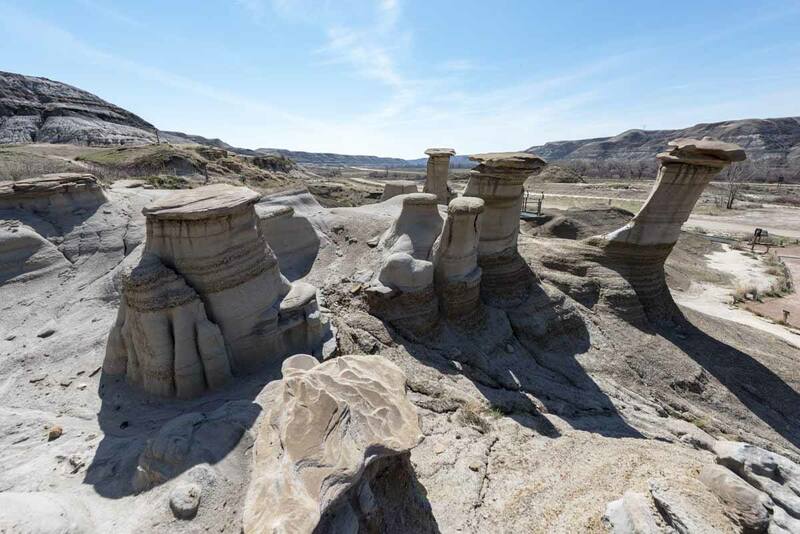 In fact, hoodoos are a product of the two combined forces that created the Badlands – sediment deposition and erosion. The wider rock layer at the top is hard, protecting the mushroom ‘stem’ underneath from erosion and creating their peculiar shape. However, erosion is still at work, and one day the stem will become too thin to support the weight of the cap, and the hoodoos will collapse. Cappadocia? No, Drumheller! here are the hoodoos! One day, though – please don’t accelerate the process by climbing over them, no matter how insta-perfect they look. 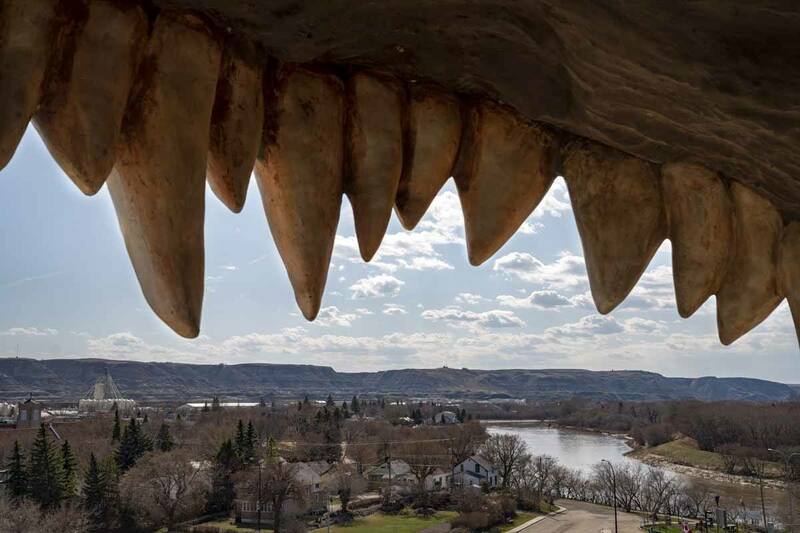 If you really do want to climb on something, I have the perfect solution – back in Drumheller you can find the biggest dinosaur in the world, a true behemoth at almost 30 meters high! It’s supposed to resemble a T-Rex, only about 4 times bigger. You can climb 106 steps through its body, up to the viewpoint which is located… in the dinosaur’s mouth! I can’t say that the view was amazing – it’s just a car park and a square with a few nondescript buildings. Yet, the feeling of looking out over the rooftops, a view framed by T-Rex teeth, was pretty cool – not to mention it’s only $4 CAD per person to climb. It was a great, fun way to conclude our visit to Drumheller – the best place in the world for dinosaur lovers! Driving is by far the easiest way to get to Drumheller. The closest airport is definitely Calgary, about one hour and a half away on Highway 2 and 9, making Drumheller and surrounds also a great day trip from Calgary. Another option is Edmonton airport, located about three hours north. We loved Edmonton, so we really recommend visiting the town, especially in summer! There are buses between Drumheller and Calgary, but as all things to do in Drumheller are fairly spread out, you’ll need a car to move around anyway. In Drumheller, we stayed at the Canalta Jurassic Motel, conveniently located on the access road into town coming from Edmonton. The rooms were spacious, nice and comfortable, with a couch and sitting area, and it included a microwave as well as coffee and tea-making equipment. Like all motels, it also included parking space just outside, included in the room rate. Our room included complimentary breakfast, and every night there was free popcorn available at reception. All in all, a good place to stay, offering really good value for money at about €80 per night. O’Shea’s – a fairly standard pub, reasonably priced and with a food and drink ‘special’ every day. We had a decent burger and fish and chips, without breaking the bank. Bernie and the Boys Bistro – a locally-run diner, offering excellent burgers with creative fillings, very good wings and naturally poutine! There’s also a nice selection of ‘old-school’ drinks like malts and floats… but strangely enough, the place wasn’t trying to be retro. It just was. The Last Chance Saloon – we didn’t actually eat there, as the place was closed due to flooding. but this eatery located in the nearby town of Wayne came highly recommended for its burgers, beers and friendly atmosphere. 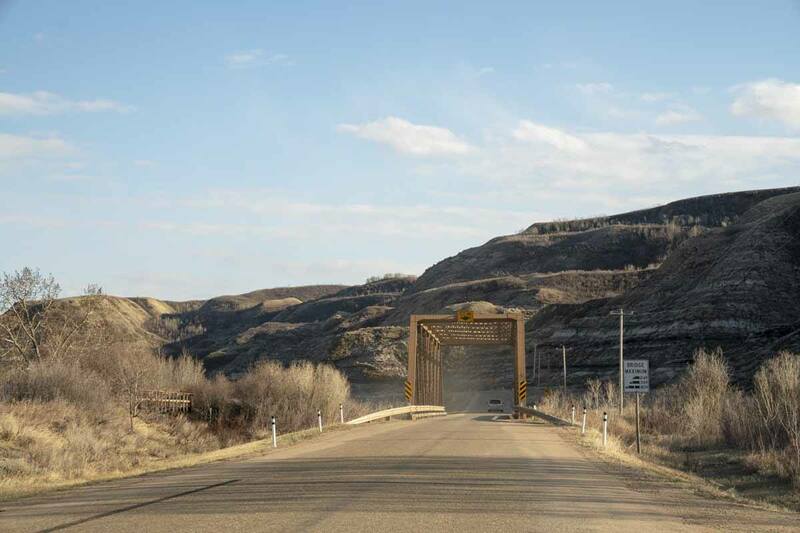 You reach Wayne from Drumheller on the scenic ’11 Bridges Road’, which (yes, you guessed it) includes 11 bridges in just 10 or so kilometers! The 11 Bridges Road travelling to Wayne! Sadly, we visited at the tail end of the low season and some of the things to do around Drumheller are only available in summer – and we even more unlucky because there had recently been a flood and some attractions were unaccessible. If you’re visiting in summer, we recommend checking out the Atlas Coal Mine, a historic site where not only can you learn about the history of coal mining in Alberta, but you can also take a tour into the tunnels and climb a wooden tipple to learn how coal was processed. 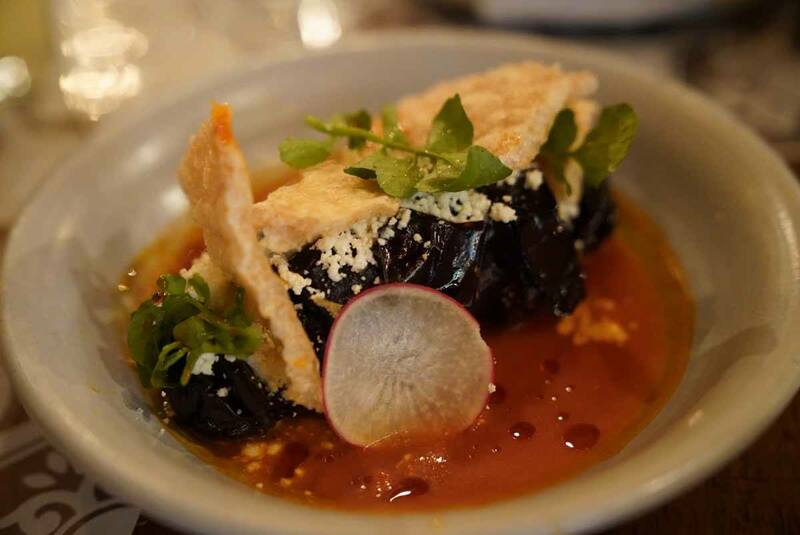 There are also photography tours and unique ‘Mine and Dine’ tours, providing an insight into the life of a coal miner that ends with a meal with locals. 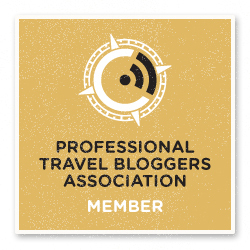 We would like Travel Alberta and the management of the Royal Tyrrell Museum for supporting our trip!